Air-Control, the innovative tool for updating apps, has launched on Kickstarter to drive support for the further BETA development of the product. Air-Control allows app developers or app owners to instantly update their apps without submitting changes to an app store. Through Air-Control’s mirror screen technology, live updates can be made to the app without submitting to an app store. Currently, the average iOS app store review time is 6 days , which can lead to unnecessary delays in the process of making aesthetic or content tweaks. 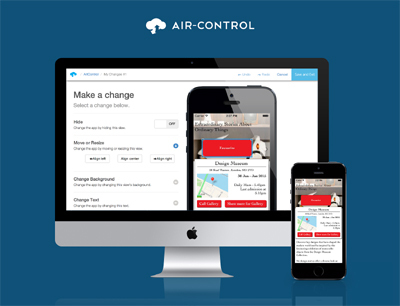 Air-Control accelerates the app development phase as it simplifies prototyping, testing and sign off. Brand owners use the tool to instantly review changes to color, user interface and text before submitting the final version. App owners can use the Air-Control content management tool anytime in the future to modify and publish changes to the app provided the relevant line of code is incorporated into the app before being submitted to the app store. There is a two-step process to set Air-Control up. First the developer installs the Air-Control library by adding one line of code into the app. They then resubmit their updated app to the app store as normal. If the developer or app owner then wants to make a change, all they need to do is log into Air-Control and startup the app on their personal device. The simple and intuitive web interface is designed to empower non-technical people to control, edit and publish app updates. To enable live editing of an app, users authenticate their devices (iPhone, iPad, etc.) with Air-Control. After logging into Air-Control.com the authenticated device’s screen is mirrored in the web interface. This mirrored device screen is editable and enables users to make changes and apply them to the authenticated device. They can choose to submit these changes to all their users, applying the new changes immediately to all their users’ devices. The people behind the development of this technology are a proven team of technology specialists. Some of Air-Control’s co-founders founded and built up a successful ecommerce platform integration provider from startup to £14m revenues, boasting some of the biggest names in retail. Air-Control is launching a campaign on Kickstarter, the world’s largest funding platform for creative projects, to raise £20,000 for further development, research and testing. Appreviewtimes.com. Figures as of 27th August 2014.